Animal models can help identify gut microbes and mechanisms, though the degree to which findings translate to humans is unknown. In humans, observational studies can show cross-sectional associations between microbes and health traits but are limited by the inability to measure causal relations. The strongest level of evidence is obtained from interventional clinical studies—in particular, randomised controlled trials. 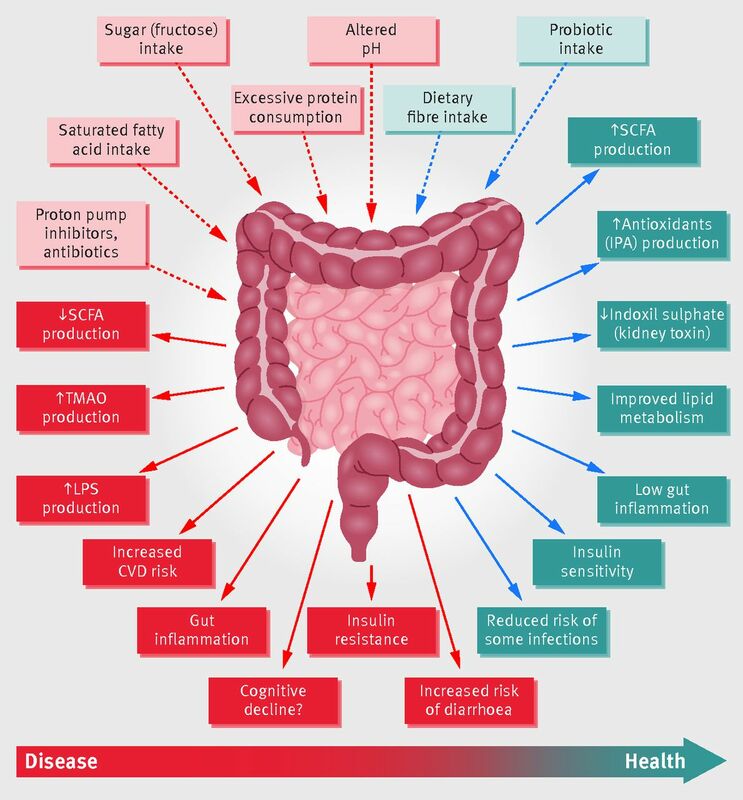 What does the gut microbiota do? The gut microbiota provides essential capacities for the fermentation of non-digestible substrates like dietary fibres and endogenous intestinal mucus. This fermentation supports the growth of specialist microbes that produce short chain fatty acids (SCFAs) and gases.17 The major SCFAs produced are acetate, propionate, and butyrate. Gut microbiota dysbiosis probably promotes diet induced obesity and metabolic complications by a variety of mechanisms including immune dysregulation, altered energy regulation, altered gut hormone regulation, and proinflammatory mechanisms (such as lipopolysaccharide endotoxins crossing the gut barrier and entering the portal circulation2930; fig 1). Specific foods and dietary patterns can all influence the abundance of different types of bacteria in the gut, which in turn can affect health (table 1). Other areas of concern include the side effects of popular restrictive diets on gut health. These include some strict vegan diets, raw food or “clean eating” diets, gluten-free diets, and low FODMAP (fermentable oligosaccharides, disaccharides, monosaccharides, and polyols) diets used to treat irritable bowel syndrome. Box 2 summarises our current knowledge on the interactions between gut microbiota, nutrition, and human health. Are natural probiotics in food better than probiotic supplements? Should we take them preventively? Can microbes influence food choices and appetite? Do low dose antibiotics in food affect human health? What is the effect of pesticides in food on the gut microbiome? Is organic food better for the gut microbiota? Should all new drugs and food chemicals be tested on the gut microbiota? Dietary amounts of protein, saturated and unsaturated fats, carbohydrates, and dietary fibre influence the abundance of different types of bacteria in the gut. The microbiota can also be modified by adding live micro-organisms to food or by periods of fasting. Probiotics are live bacteria and yeasts that, when administrated in a viable form and in adequate amounts, are beneficial to human health. They are usually added to yoghurts or taken as food supplements. Probiotics are live micro-organisms that, when administered in adequate amounts, confer a health benefit on the host).88 Probiotics (mostly Bifidobacterium and Lactobacillus species) can be included in a variety of products, including foods, dietary supplements, or drugs. There are concerns that most microbe supplements are unable to establish themselves in the gut and fail to exert an effect on the resident community.8990 But probiotics can affect health independently of the gut microbiota through direct effects on the host; for example, through immune modulation or the production of bioactive compounds. The therapeutic effect of probiotic supplementation has been studied in a broad range of diseases. A study on response to bread68 using a randomised crossover trial of one week long dietary interventions showed significant interpersonal variability in the glycaemic response to different bread types. The type of bread that induced the lower glycaemic response in each person could be predicted based solely on microbiome data collected before the intervention.68 Much more research is needed to establish whether these kinds of personalised approaches are feasible, sustainable, and have a positive effect on clinical outcomes. We are entering an era where we can increasingly modify health through food and measure the effects through our microbes or metabolites. Fibre is a key nutrient for a healthy microbiome and has been overlooked while debates have raged about sugar and fat. The adverse effects on the microbiome of drugs and processed food ingredients can no longer be ignored. Given the current gaps in knowledge, we need clinical evidence that can be translated into clinical practice, ideally through randomised controlled studies that use consistent matrices of prebiotics or probiotics or faecal microbiota transplantation to assess changes in gut microbiota composition and in health outcomes. Contributors and sources: AMV studies the molecular basis of ageing and complex disease and has recently investigated the role of gut microbiome composition on cardiometabolic disorders. JW has studied and reported widely on the microbial ecology of the gut microbiota, its role in host health, and how it can be modulated by diet. ES heads a multidisciplinary lab of computational biologists and experimental scientists focusing on nutrition, genetics, microbiome, and their effect on health and disease. His aim is to develop personalised nutrition and medicine. TDS leads the TwinsUK registry and British gut project as the head of a multidisciplinary team studying the genetic, dietary, and lifestyle determinants of human gut microbiome composition and its relationship to common diseases. All authors contributed, read, and approved the final version. Competing interests: We have read and understood BMJ policy on competing interests and declare the following: AMV and TS are consultants to Zoe Global. JW has received research funding from industry sources involved in the manufacture and marketing of prebiotics and dietary fibres and is a co-owner of Synbiotics Solutions, a developer of synbiotic products. ES is a consultant of DayTwo Inc. AMV is funded by the NIHR Nottingham Biomedical Research Centre. JW is supported through the Campus Alberta Innovates programme and grants of the Canadian Institute of Health Research (CIHR), Natural Sciences and Engineering Research Council of Canada (NSERC), the JPI HDHL, and the Canadian Foundation for Innovation. ES is supported by the Crown Human Genome Center; the Else Kroener Fresenius Foundation; Donald L. Schwarz, Sherman Oaks, CA; Jack N Halpern, New York, NY; Leesa Steinberg, Canada; and grants funded by the European Research Council and the Israel Science Foundation. TwinsUK was funded by the Wellcome Trust; European Community’s Seventh Framework Programme (FP7/2007-2013). The study also receives support from the National Institute for Health Research (NIHR) BioResource Clinical Research Facility and Biomedical Research Centre based at Guy’s and St Thomas’ NHS Foundation Trust and King’s College London. TDS is an NIHR senior investigator. This article is one of a series commissioned by The BMJ. Open access fees for the series were funded by Swiss Re, which had no input on the commissioning or peer review of the articles. The BMJ thanks the series advisers, Nita Forouhi and Dariush Mozaffarian, for valuable advice and guiding selection of topics in the series. Kootte RS, Levin E, Salojarvi J, et al. Improvement of insulin sensitivity after lean donor feces in metabolic syndrome is driven by baseline intestinal microbiota composition. Cell metabolism. 2017; 26: 611-9 e6. O'Keefe SJ, Li JV and Lahti L. Fat, fibre and cancer risk in African Americans and rural Africans. 2015; 6: 6342. Korem T, Zeevi D, Zmora N, et al. Bread affects clinical parameters and induces gut microbiome-associated personal glycemic responses. Cell Metabolism. 2017; 25: 1243-53 e5.
. Gut microbiome composition predicts infection risk during chemotherapy in children with acute lymphoblastic leukemia. Clin Infect Dis2018doi:10.1093/cid/ciy153 .
. Code of Federal Regulations Title 21 Subpart E: Specific Requirements for Health Claims[23 pp.]. EFSA J2016;14:4369.